The model view of a mass suspended from a spring, displaced vertically and released to move freely to produce up and down motion with right panel showing the displacement, velocity and acceleration. Q1: under what conditions would this vertical spring mass system’s motion be not well modeled as a simple harmonic motion? H1: the model assumes the restoring force by the spring is F = -ky, it is always correct for any magnitude of oscillation y in real springs. Is it always valid in the real spring motion when the spring is hyper extending beyond the linear limits of Hooke's Law ? 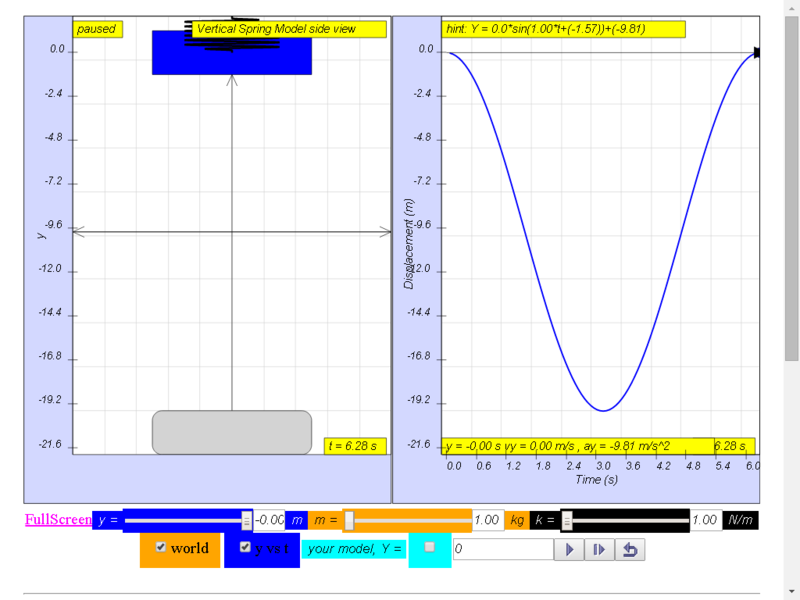 Q2: change the simulation y=0 m and Play the model. In the your model Y = _________, suggest your own suitable model that can describe the motion y.
Q4: carry out some other conditions, verify that the general equations for displacments if can be model by Y = Y0sin(ωt+φ)+Yshift where the usual symbols have the usual meaning. Hence or otherwise, Suggest with reasons, the meaning of Y0 , ω , φ , and Yshift. aY = - ω2Y0sin(ωt+φ). Test them out using an example of your choice. Explore some factors that affect the period of a spring. Press the play button. Watch the graph to see how the height of the mass changes as it moves up and down. Use the graph to determine the period of the mass-spring system. Adjust the scale by dragging the numbers on the axes. Change each variable – gravity, spring constant, starting distance and mass – and observe how each one affects the period. Can you explain why? Is this different from the relationships for a pendulum? Try the damping slider. Does damping change the period? 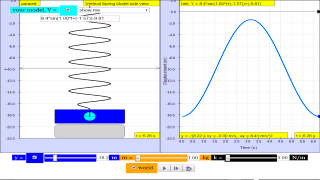 Explore the motion of a pendulum on a spring. Press the play button. Watch the graphs to see the motion of the spring pendulum. Can you distinguish the pattern of spring motion (up and down) from the pattern of pendulum motion (back and forth)? How are the two related? Is there a regular pattern to the motion? Compare the periods of the two graphs. How many different patterns can you produce by changing the variables – gravity, rod length, mass and spring constant? Under what conditions does the energy switch between back and forth and up and down? Does the initial starting angle affect the patterns when all the other variables are unchanged?